This photo is from mid-September 2012, the 18th in fact. Crikey. But sewing hasn’t become any less alluring. 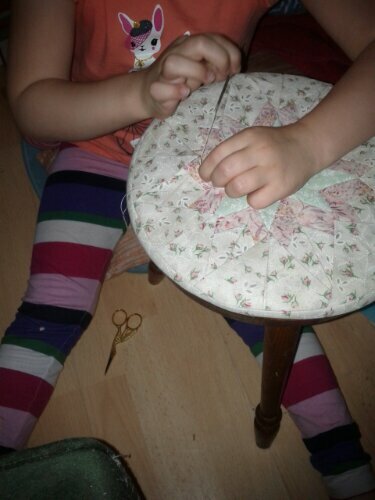 In fact, someone (who is 7) got a sewing machine for Christmas and has been stitching up a storm. Little tote bags for all her friends, bits of cross-stitch, some mending (lovely green patches on a white linen shirt from the scrap basket, now hung in Daddy’s wardrobe again. He’d better wear it!) and even a bit of knitting. It’s like a Bagthorpian String. One. One two. One. One. One two. One two. Ahem. It’s time for my annual post, I guess. We’ve come out of a long hard haul, lifewise and are starting up again. Christmas brought chemistry sets, so we’re baking again, and there were cheap cartridge pens so the older two are practising their handwriting. My eldest signed up for Mathletics. The youngest counts to ten and a bit. I’ve almost totally stopped painting, but they’ve all just started up again. Train tracks are big. Telly is big. Stars and planets are big. Reading is the biggest of all, for the eldest, and medium-large for the others, though they’re not independent readers yet really. I expect this year to go rather better than last, what with no chronic illness, no building works, and plenty of space and time. 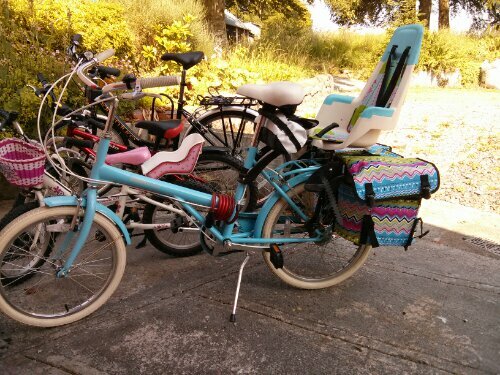 Before we left I ordered new panniers for my bike. I adore them. 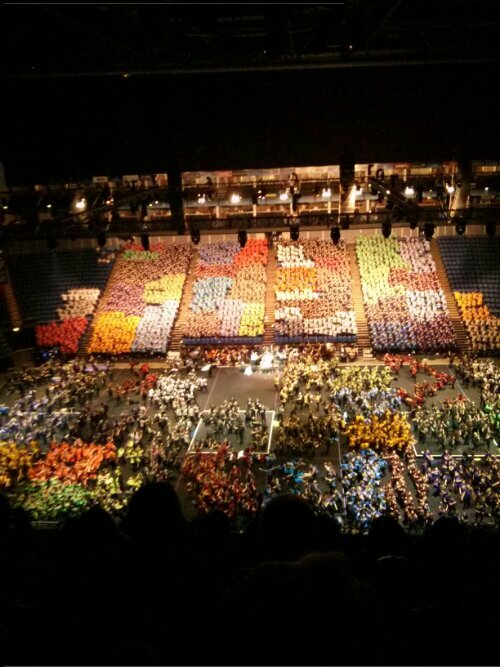 One of those little military green dots is my eldest daughter, performing in the O2 Arena in London for Theatre Train’s 20th anniversary. The castle falled into the river. In this story I need a rope. Lily jumped into the river and tied the other end of the rope onto the bit of the castle and then she climbed out and I pulled really hard and it was on the ground! 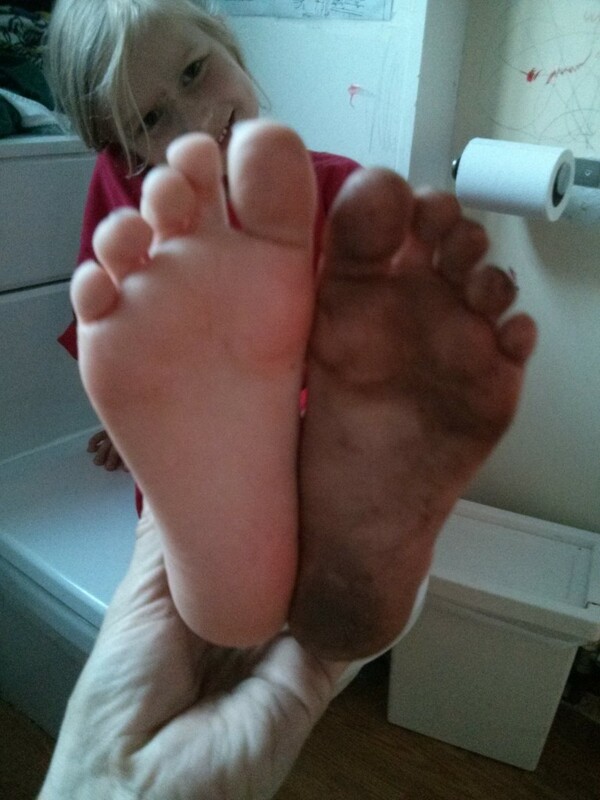 What did you learn at home today, dear little child of mine? Sunset isn’t until after 9pm now. I love summer. That was the first novel my father ever read, according to family apocrypha. So the phrase sticks in my mind. Today I noticed our apple tree is Doing the Thing – at first I didn’t know what to look for, because although I grew up with apple trees I seem never to have looked closely at them in spring. 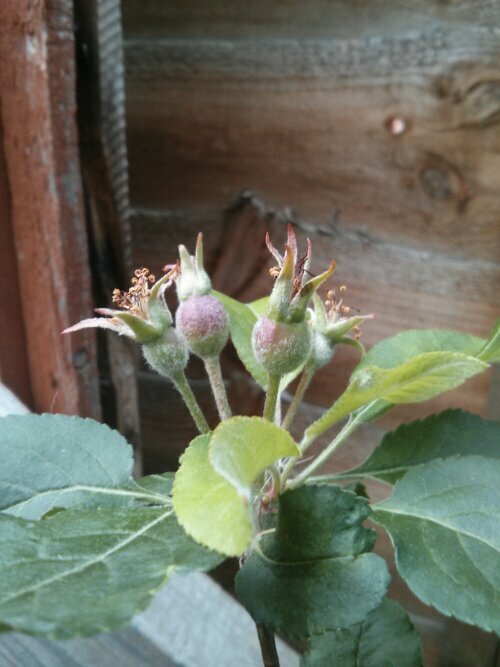 But I saw something that looked like rosehips today and sure enough, it’s baby apples, only waiting to grow into delicious nutritious (or possibly small, sharp and wormy) eating apples later in the year. The children are uninterested and delighted, respectively. The potatoes haven’t flowered yet, so today’s fishing trip into the bags of compost was fruitless. No pun intended. We’ve been in a weird place lately. Not literally, in that we’ve been at home, but we took the toddler for a tonsillectomy on Thursday and have spent the last five days at home without visitors to minimise her risk of infection. Today was the first day I did anything overtly educational because I’ve been mainly providing the calories and fluid for the toddler, in a preprocessed kind of way, and lamenting that no-one told me an adenoidectomy would have a major, dramatic effect on breastfeeding. Last night I printed off a bunch of Lear and Milne poems and some MEP Y6 worksheets, and today I stuck the poems to the dining room door and read them to the kids, and they had a whack at illustrating them. The 9yo produced an interesting and quite faithful to the poem Pobble, and the 6yo did a Jumblies drawing with the focus on the Sieve. Then I got out my maths sheets and I did some (working out what the questions mean is interesting. It was mainly about place value, I think, unless I misunderstood completely) and the older two did some of their own, with coloured pens. I find it very interesting how they can do far more complicated things mathematically than they can do when presented with a worksheet, but they are beginning to agree with me that learning to speak “worksheet and textbook language” might be important. And I need to learn alongside them, because it’s not a language in which I have ever been fluent. E (age 6) is, like me, inclined to nitpick the ambiguities even when she understands the actual intent. And finally, we did some handwriting. This is because everyone finds Rob’s handwriting almost impossible to read, and they don’t want to end up like that. BUT it turns out that E doesn’t want to write lower case EVER except the letters e and i. 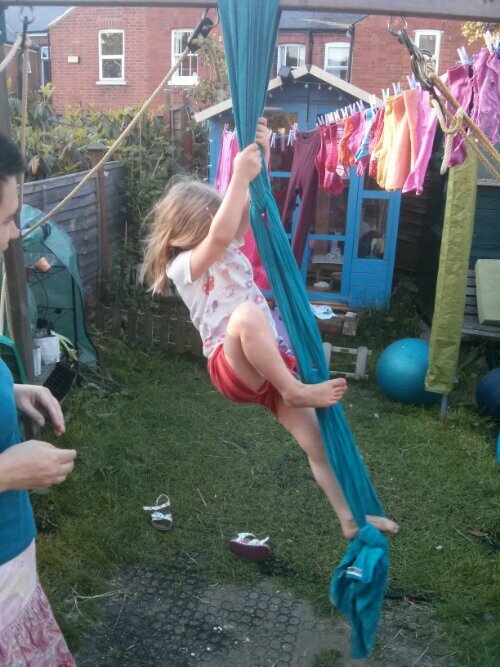 And L doesn’t want to practice, just to be able to do it, magically. So we stopped and ate some of the bread I’d made instead. I think they also watched quite a bit of telly. 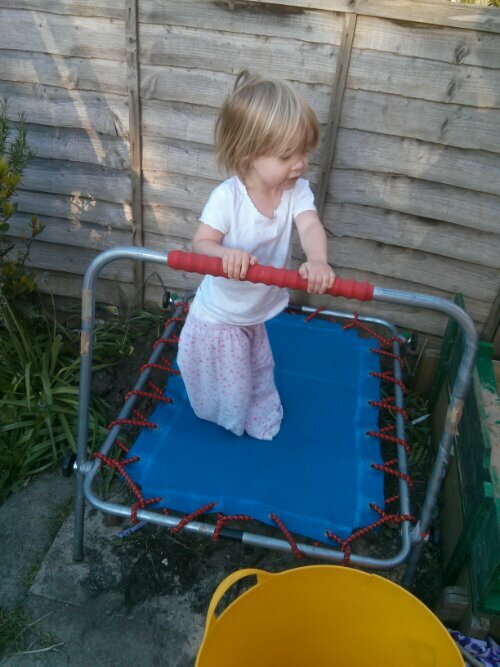 We have a trampoline in front of the telly now. Oh, and they did the basic pocketmoney sums of working out how much money they had and how many sweets they could buy with it. And some complicated games we didn’t see but overheard chunks of, which wasn’t as alarming today as it is sometimes. The last thing I heard them doing was being fax machines. I think the kids spent the equivalent of a full school day watching telly today. 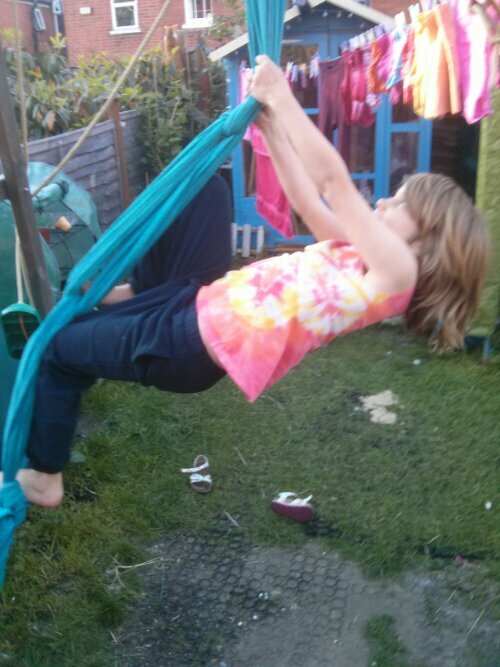 The six-year-old cried out at bedtime that she hadn’t had time to do ANY playing. 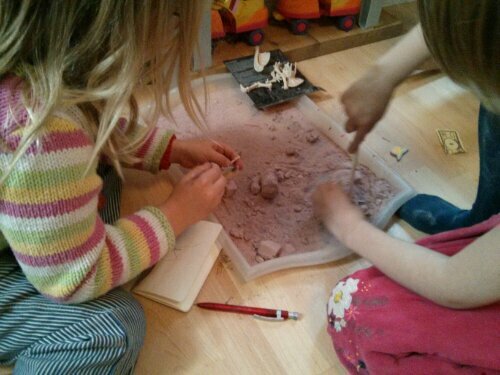 But here they are cooperatively excavating a dinosaur; one to dig and one to brush and take notes. They can’t tidy up the dust yet because it helps it look like a real archaeologists’ site. Maybe I can get them to damp it down, since archaeologists are usually working in mud? Pau Amma on Is anyone still reading?